AZITO is pleased to introduce new artworks by Yuichi Yokoyama. Yokoyama is an artist who uses manga as a medium to express his world. To date, he has produced many manga books, which has gained high acclaim both in and out of Japan. Yuichi Yokoyama’s manga, which he describes as “drawing time”, is a clear departure from common story form manga. Dialog is sparse and onomatopoeias such as “do do do do” and “wa-” are boldly used. In an atmosphere that is uncanny but attractive, cool characters freely move around with a sense of speed. This unique expression that Yokoyama himself describes as “neo-manga” has easily overcome the limits of a two dimensional media to superbly draw “time” and “space”. His work brings fresh surprises and excitement to the viewer and has continued to have great impact extending beyond the genre. 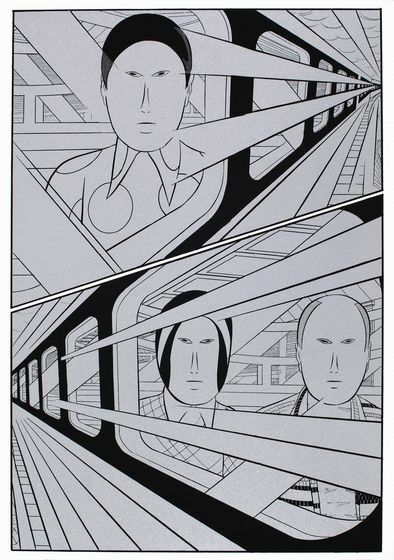 For the artwork “Travle”, this image was taken from Yokoyama’s manga titled “Travel”. In this story, the three men, who are depicted in this piece, travel by train to their destination. The usual comic book onomatopoeias do not appear in this manga, but there is a sense of speed throughout the entire story. The book was printed in black and white, but the artist chose silver for this silkscreen reincarnation. The story seems to tell a tale of travels into the future, and the color aptly portrays that atmosphere. The image of “BBF64″ was selected from Yokoyama’s artbook “BBF (Baby Boom Final)”, and was reproduced as a slikscreen. The number 64 implies that there are 64 faces in this work, but there are actually more than 100 faces. The faces belong to Yokoyama’s character named “baby” from his comic book titled “Baby Boom”. 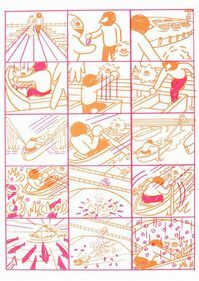 “Boat (part)” is a scene from Yokoyama’s manga titled “Baby Boom”. An adult with a bird-like face and a little furry baby chick-like creature sets off across a pond on a boat. Yokoyama chose this scene, because the character “baby” in the right-hand cell of the second row is depicted the cutest here, out of all the drawings of “baby” in the book. Through the manga “Baby Boom”, Yokoyama attempts to convey the humor in cuteness. As he observed innocent children’s adorable behavior, he found a comical side to their cuteness. I would like to recommend you to read Yokoyama’s manga books too, to immerse your self in his world!